Sunday's weather was much better than Saturday's and I headed out around 7 AM with the intention of covering more distance than I'd done in any other run over the last week. It was colder than I expected and I regretted not bringing a hat that covered my ears. I knew that the heat I'd generate from running would eventually resolve that and it did after about ten minutes. I headed over to neighborhood #2 for a change of pace and did the widest loop I could navigate and ended up covering about 4.75 miles at 9:08. I then returned to my nice warm house where everyone was up and ready for breakfast. Before long my brother and his family headed into the city to see my dad and to take in the sites at Rockefeller Center and Central Park. We had a fun visit and it was great seeing them again after visiting them in Boston just a few weeks ago. I heard from my friend at work who recently ran the Baltimore Half Marathon with an impressive time. She suffered some injuries post-race and was advised by her doctor not to run for some weeks. I was happy to hear she was back on the road and running pain-free. She recently bought Brooks Adrenalins after analysis at Jack Rabbits in Union Square. I'm very curious to hear her impression of the 10's since they are on my short list for when I replace my 9's that have about 400 miles on them at this point. I'm also interested in the new ASICS GEL-2150's and the Mizuno Wave Inspire 6's. It's great when you have to buy new running shoes. Happy Holidays! New to your site, but yes, it is great when it is time for new shoes. 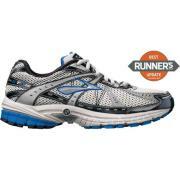 Next week I will be picking up asic gel kayanos 14. Can't wait, as mine (first pair) have 500 miles on them and have done great. Sticking to the same pair. Will be back to read more of your recent posts soon. Until then, have a great day and........Keep Running! Welcome to the Emerging Runner! Runner's World loves the Kayanos so do many people I know. I tried a pair that were on sale at DSW a month ago and thought they were good but not quite snug enough in the heel to fit my foot. Thanks for reading the blog and writing. I look forward to reading more on your site as well. No prob. If you dont mind I will add your site to my blog roll. Hey, thanks - I don't mind at all! I just got the same exact comment in one of my posts as well. Hmmmm! I changed my comment moderation to require anonymous comments to do word verification. You may want to try that as well.